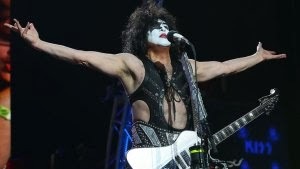 Just fresh off the recent Rock and Roll Hall of Fame induction announcement Tuesday morning, Paul Stanley of KISS joined The K-EARTH 101 Morning Show to give us his reaction to the classic rockers being named one of the 2014 inductees. To the band and many fans, KISS’ inclusion to the Rock Hall seems overdue. After years of being snubbed a nomination to the prestigious hall of fame, KISS was finally recognized this year, which was met with overwhelming support in the fan ballot. KISS will be inducted to the Rock Hall along with Nirvana, Peter Gabriel, Daryl Hall & John Oates, Linda Ronstadt and Cat Stevens. Though the induction may have felt like a long time coming, now that it’s happened, Paul is just going about his normal routine. He even tells us that he’ll see fellow inductee Dave Grohl (formerly of Nirvana) this morning at their children’s school play. In addition to becoming a recent Rock Hall inductee, Paul is also co-owner of the new Los Angeles Arena Football team, L.A. KISS, with his bandmate Gene Simmons. Paul explained that he and Gene wanted to bring football back to L.A. with this “high impact and very exciting” league, which kicks off its first season in March at the Honda Center. Paul explains that L.A. KISS is made up of the “upper one percent of players” and not only will fans have a great time at the game, but take in spectacular entertainment each game. For fans who buy the $99 season ticket special, there will even be a full scale KISS concert to cap off the first season. “That will be a great way to say thanks and to inaugurate that first season,” he said, noting that the band will also be marking a major anniversary next year. The L.A. KISS kicks off its first season at the Honda Center in March. For the full schedule and tickets, visit www.lakissfootball.com.